"Puts the Fresh Back Into Water"
3R Purogene is used to control harmful bacteria growth in drinking water systems. Using the oxidizing power of chlorine dioxide (ClO2), Purogene eliminates bacteria and odors without coloring the taste of the water like other disinfection products such as chlorine. Purogene is the ultimate antimicrobial product for fresh water storage and system disinfection. Purogene contains 2% Chlorine Dioxide in a stabilized form. Because it's stabilized, it only reacts as needed to control bacteria which provides longer term residial antimicrobial effectiveness. Purogene has been shown to be more effective than other common water sanitizers against harmful bacteria such as E-Coli, Salmonella, Listreia, Staphylococcus, Aspergillus, Pseudomonas and Legionella among others. Purogene also requires much lower concentration levels to provide effective microbial elimination. For general antimicrobial control, Purogene is added to the water at a rate of 1 ounce Purogene to 30 gallons of water to produce a 5 PPM (parts per millon) concentration. Purogene is not only used as a low-oncentration water additive to control bacteria, but is extremely effective as a complete system disinfection product when activated with Citric Acid Crystals. Using Purogene activated with Citric Acid Crystals effectively eliminates harmful bacteria and strips away biofilm that adheres to internal system surfaces. 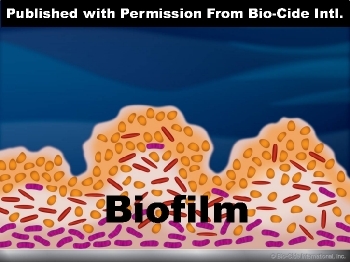 Biofilm is formed when bacteria freecells attach to the internal surfaces of fresh water systems. Most disinfection oxidizers will only react with the bacteria on the surface but leave the underlying cells alive to continue to grow. As these underlying cells mature, they can break through the surface to produce more freecells. How Does Purogene Remove Biofilm? The high concentration of chlorine dioxide released by activating Purogene with Citric Acid Crystals penetrates the surface of the biofilm clear through it to the attached surface. The biofilm is broken down and releases from the surface. Continued use of Purogene after a system disinfection prevents formation of new biofilm. By controlling the freecell bacteria in the system, Purogene effectively prevents any new biofilm formation. Purogene is so effective at bacteria and biofilm control/removal that it's approved by most major airframe manufacturers for use in the water transfer tanks and water systems in aircraft. For more than 35 years, Purogene has been protecting the fresh water systems in aircraft all over the world. Purogene has virtually no smell or taste at the standard treatment level of 5 PPM (1 ounce/30 gallons of water). Other sanitizers can alter the taste and smell of water in an offensive way. Purogene contains no free chlorine. Purogene does not produce potentially harmful or carcinogenic byproducts like some sanitizers. Unlike many other disinfection agents that leave behind toxic byproducts, the residual component from the antimicrobial action of Purogene is simple table salt. Purogene is long-lasting. Because of it's low reactivity as compared to other sanitizers, Purogene controls bacteria over a longer period. 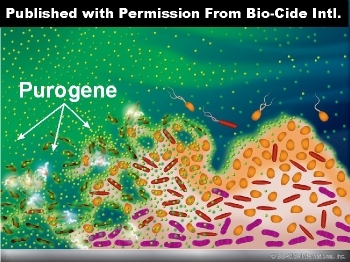 Purogene controls bacteria at a much lower concentration than required with other sanitizers. Purogene is less corrosive than other sanitizers making it suitable for all tank materials. Purogene is economical to use at just $.82 per 30 gallon treatment (based on quart pricing).